Paris-based contemporary clothing label 13 Bonaparte is bringing its unique collection of apparel to America for the first time. Its pop-up shop opened yesterday, in response to a heightened demand from American customers. The pop-up will sell the brand’s midseason wardrobe and premiere its expanded le denim collection, which includes pieces designed specifically for women. The le denim collection is a startlingly wide array of fashion options made only of denim fabrics of varying washes and thicknesses. 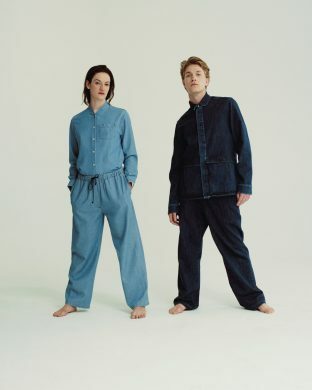 Essentially, they’ve denim-ized almost every type of apparel, from hoodies and pleated pants to jumpsuits and crop tops along with some more expected denim offerings. This is also the first time the brand, billed as a contemporary menswear label, has formally sold any womenswear. Despite adding some traditionally feminine “women’s” items to their collection like skirts and dresses, the brand isn’t totally running with binary sartorial stereotypes, which is promising in a time when gender-neutral fashion seems to be increasing in popularity even in bigger brands. For the most part, they simply saw which items were most popular among women clientele and adjusted sizing accordingly. Though the line still retains binary labels of “womenswear” and “menswear,” the distinctions are by no means rigid. 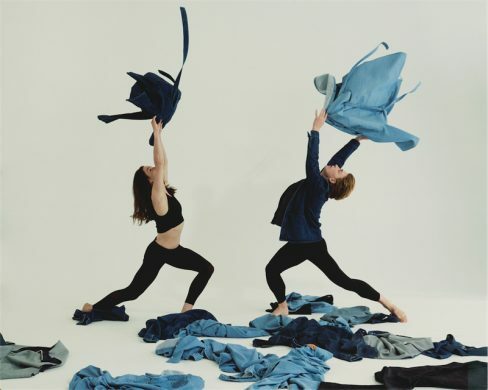 Safarti flips through photos of the collection, pointing out that both the male and female ballet dancers (Harrison Ball and Megan LeCrone of the New York City Ballet) who serve as the campaign’s models are wearing items from the men’s and women’s collections. “It’s all about blending together,” Safarti says. This “blending” he speaks of doesn’t just apply to gendered clothing, but is a philosophy that can be seen in all parts of the brand’s operations. 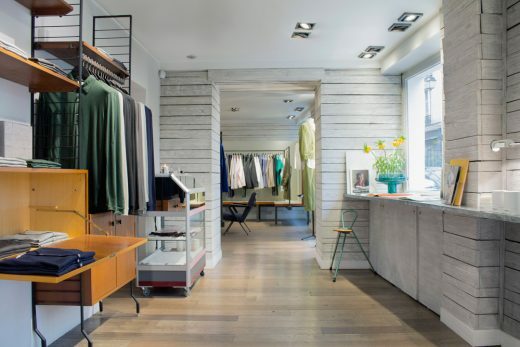 Even their Paris headquarters carries this fluidity, acting as showroom, design studio, office, and retail store all in one. The NYC pop-up contains elements of this mix, having been deemed a “traveling stockroom” with a design concept that revolves around basic stock unit shelves and raw materials. Safarti firmly believes in the idea that when you find a cut and fit you like, you should be able to stay with it. 13 Bonaparte’s collection reflects this, consistently offering the same designs along with new styles so that customers have new options but can also rely on the brand to carry what has worked for them in the past. Even le denim fulfills this, as many of the classic 13 Bonaparte styles have been converted to various washes and makes of the fabric. Not only are the clothing items consistent in look and fit, they are also consistently practical. Safarti is particularly drawn to adjustable straps and buttons, elastic waistbands, and large accommodating pockets. “Every piece has to be functional. We live with [clothes], we need it to be practical and comfortable. Everything is for a reason; we don’t do details like this because it’s nice,” Safarti says. The brand’s New York pop-up is located in the heart of the Lower East Side on Rivington Street. It’s an area Safarti, who used to live in the city, is drawn to for its proximity to the New Museum and the International Center of Photography. He also dabbles in photography himself, and a zine of photos taken by Safarti will be on view in the pop-up, in addition to images from the le denim photoshoot. After the pop-up ends its run in early May, the brand will be making its way to the west coast to for a yearlong residency in Downtown Los Angeles. And hey, if you’ve noticed the influx of French people in Brooklyn, maybe dressing like one will help you understand this migratory phenomenon. 13 Bonaparte’s pop-up shop is open from 11 am to 8 pm, April 19 to May 1 at 2 Rivington Street, Lower East Side. There will be an opening party on April 20, 6 pm to 9 pm.